The Context object provides information about your function and the environment in which it is running, such as the function name, its memory limit, its logger, and the amount of time remaining, in milliseconds, that the function has to complete before AWS Lambda kills it. With that overview out of the way, we'll spend the remainder of Part 1 building a simple Lambda function that returns a widget. For the purposes of our example application, the user requests a widget by ID (a String), which we'll wrap into a WidgetRequest object. The function will then return a Widgetobject as its response. The GetWidgetHandler class implements the RequestHandler interface, accepting a WidgetRequest and returning a Widget. The WidgetRequestincludes an id parameter to indicate which Widget is being requested. For the purposes of this example, however, we won't load the Widget from a database. Instead, we'll build and return a new Widget instance with the specified ID and the name "My Widget ID." We'll do this on the fly. Listing 5 shows the contents of the Maven POM file that can build a JAR file containing our Lambda function. 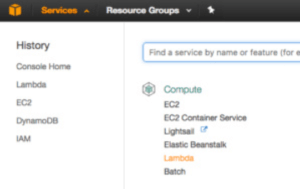 The command creates a file named aws-lambda-java-1.0-SNAPSHOT.jarin your target directory. We'll upload this file to AWS Lambda in the next section. Now that we have a Lambda function written and packaged into a standalone JAR file, let's set it up in AWS Lambda. Before proceeding with this step, you'll need to setup a free AWS account. Go ahead and do that now. Once you have your account, login and open the AWS console. Click on Services, then choose Lambda in the Compute section, as shown in Figure 3. Click the Create a Lambda function button and select Blank Function, as shown in Figure 4. At the time of this writing, there are no blueprints for creating Java Lambda functions, so you'll need to start the function from scratch. 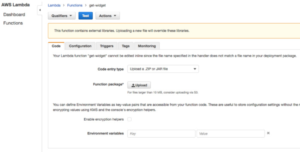 The first screen that you will see after selecting a blank function is the Configure Triggers page, shown in Figure 5. API Gateway: Allows a call to a RESTful resource to be forwarded to your function. AWS IoT: Calls your function in response to an IoT (Internet of Things) events. Alexa Skills Kit: Allows you to create Alexa voice-activate skills. Alexa Smart Home: Handles Alexa Smart Home device events. CloudFront: Calls your function in response to CloudFront events, allowing you to customize content delivered by CloudFront (AWS's CDN solution). CloudWatch Events: Calls your function when a CloudWatch event or alert occurs. CloudWatch Logs: Calls your function when specific messages are logged to CloudWatch. CodeCommit: Calls your function when code is committed to CodeCommit, which is AWS's CI solution. DynamoDB: Calls your function when data is inserted into a DynamoDB table. 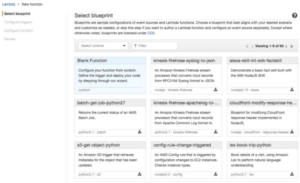 Kinesis: Calls your function in response to analytics events. S3: Calls your function when a file is uploaded to S3. SNS: Calls your function when a notification is published to the Simple Notification Service. We'll leave this blank for now, because we're going to call our Lambda function directly. Click Next and you'll see the Configure Function screen shown in Figure 6. Give your function a name (in this case it's "get-widget") and a description. Choose Java 8 as your runtime, which will add a dropdown that allows you to choose a JAR file to upload. Click the Upload button and find the JAR file that you built earlier in this tutorial. Below this, you'll see the page to configure your Lambda function handler and role, as shown in Figure 7. Next, you'll specify a role for the function. Before doing that, let's make sure you understand roles in AWS Lambda. 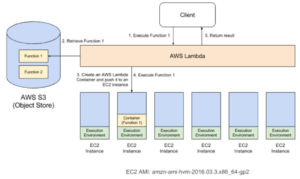 Roles define policies that grant the executor (in this case a Lambda function) permission to interact with AWS Lambda and other AWS resources. For example, if your Lambda function was going to query a DynamoDB instance, then it would need access permissions for dynamodb:Scan and probably dynamodb:GetItem. If your Lambda was going to add an object to S3, it would need access permission to s3:PutObject on your S3 resource. The important thing about roles is that they grant or deny permissions for your Lambda function to interact with other AWS resources. Roles have nothing to do with application users or your application's internal configuration. Rather, they define how your application can or cannot interact with AWS resources. For this example, we don't need any special permissions because our Lambda function doesn't actually do anything. We do need to be able to access DynamoDB for the examples in Part 2, however. To setup that permission, we'll start by creating a new role from a template. We'll name it get-widget-role and add the policy template "Simple Microservice Permissions." 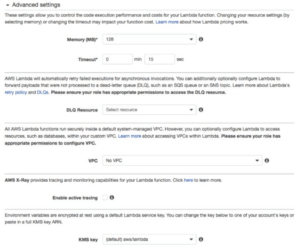 The Simple Microservice Permissions role is part of an existing Lambda blueprint, and provides full access to DynamoDB. Its contents are shown in Listing 6. Allow the specified actions (DeleteItem, GetItem, etc) on resource arn:aws:dynamodb:us-east-1:YOUR_ACCOUNT_NUMBER:table/*, where YOUR_ACCOUNT_NUMBER will be your account number and table/*means all of your tables in DynomDB. If you wanted to refine the policy further, you could specify a single table name instead of all tables; or you could change the list of allowable actions. For example, a function that simply retrieves an item from DynamoDB does not need permissions to delete, put, or update items, so you might remove those. Finally, expand the Advanced Settings section, which is shown in Figure 8. Once again, we can leave most of this alone. Because we pay for Lambda executions both by execution time and by the amount of RAM that we use, we can reduce the memory requirement from 512MB to 128MB. You may be thinking that 128MB is not a lot of memory for a Java application, but recall the Lambda functions are small and simple. A function is not like a servlet container that starts a web application and leaves it running for hours or days on end, so for most purposes 128MB is just fine. Another important thing to notice on this screen is the timeout. Because Lambda functions are meant to be short-lived and you pay for execution time, AWS Lambda allows you to specify a timeout. If your function does not complete within the allotted time, it will be killed. This protects your cloud bill in case things go wrong. When you're ready, press Next. Review the summary of your function, then press Create Function. 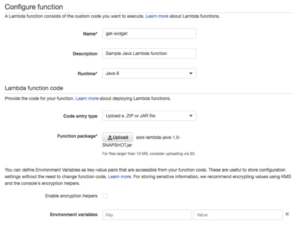 Now that you have your function deployed in AWS Lambda, let's use the AWS console to test it out. After creating your function, you should have been dropped off on your function's page (Lambda > Functions > get-widget). If you need to, you can always navigate through Services to Lambda, then click on Functions and choose your function name (in this case, get-widget). Either way, you'll land on the page shown in Figure 9. To test your function, click the blue Test button and you will be prompted to define a new test event. Recall that the Lambda function accepts a WidgetRequest, which has a single id parameter. Because you implemented the RequestHandler interface, AWS Lambda will deserialize the JSON that you pass in your test event into a WidgetRequest object. All of this is to say that to test the function you only need to specify an id field, as shown in Figure 10. 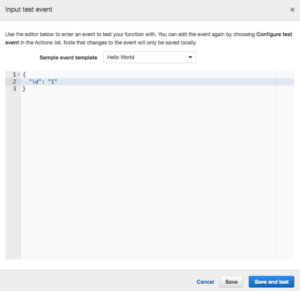 Click the Save and Test button and AWS Lambda will run your function with the sample event. If you did everything correctly, you should see a response similar to Figure 11. The top portion of the page shows the response body, which has an id and a name. The summary section shows the amount of time that the function took to execute. In this case, you should see 296.14 ms followed by 300 ms, which is the amount of time billed. You will also see the maximum amount of memory that was used, in this case 41 MB. The log output shows any logs that you may have written through a System.out.println() statement, or by accessing the Context object's logger. For fun you might want to test the function again and notice the change in duration. When I ran it a couple more times, the durations that I observed were, respectively, 4.4 ms and 0.64 ms. The reason is that the first time the lambda runs, AWS needs to create a container with your JAR file and deploy it to an EC2 instance. Once it has been deployed on an EC2 instance, the function will run very quickly. Note, however, that if you do not access your function for an undetermined period of time, AWS Lambda will remove your container from the EC2 instance and you'll need to absorb that initial deployment overhead again. If you've got all of this working so far, congratulations! You've built, deployed, and tested your first Lambda function. 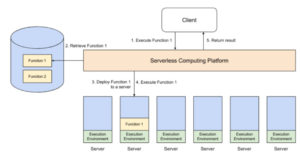 In this article we've answered the question, "What is serverless computing, anyway?" You've learned how serverless architectures employ nanoservices (versus microservices) to increase application scalability, while lowering the price of delivery. I introduced the serverless computing execution model and the Function-as-a-Service concept, and explained the relationship of functions, as they are used in AWS Lambda, to functional programming. Finally, you built a Lambda function in Java, then deployed the function to AWS Lambda and tested it in the AWS Lambda console. In Part 2, we'll add support for Amazon's DynamoDB. Using DynamoDB, you'll setup your Lambda function to manage widgets on the server, rather than creating them on-the-fly. You'll also leverage the AWS SDK to create a Java client application that can invoke your Lambda function from outside of AWS. Finally, you'll use the AWS Identity and Access Management service to create an IAM user, group, and custom policy for your example application, which we'll then build and run. Editorial Note: This article was originally published by JavaWorld.